BAGHDAD — A Muslim cleric who once used a militia to resist the American invasion positioned himself as a big winner in Iraq’s months-long political deadlock Friday when his party threw its support behind the beleaguered prime minister. The hard-line Shiite group led by Muqtada al-Sadr called it the start of its ascent to nationwide power — a specter sure to spook the United States. Washington considers the cleric a threat to Iraq’s shaky security and has long refused to consider his movement a legitimate political entity. But Prime Minister Nouri al-Maliki may be unable to govern without him. March elections failed to produce a clear winner and left the nation in turmoil — a power vacuum that U.S. military officials say has encouraged a spike in attacks by Sunni insurgents. Final agreement on how to form the new government could still be weeks if not months away, but “the Sadrist acceptance of al-Maliki as prime minister could begin to break the logjam,” said Iraq expert Daniel Serwer of the U.S. Institute of Peace in Washington. But it is clear to Iraqi and U.S. officials that al-Sadr seeks unfettered and increased influence in the next government if al-Maliki comes out on top. The cleric, whose militia once ran death squads out of the health ministry headquarters in Baghdad to target Sunnis, has been in self-imposed exile in Iran since 2007. As part of agreeing to back al-Maliki, a leading Sadrist said the movement has demanded key government positions, including deputy parliament speaker and as many as six Cabinet-level ministry posts of the 34 to be filled. Controlling service agencies like Iraq’s health, oil, construction and electricity ministries would allow Sadrists to hire supporters and boost political loyalty. Sadrists also are clamoring to run the trade ministry, which would carry some sway over foreign policy, and at least one of the agencies tasked with Iraqi security missions — a huge red flag to U.S. officials. Down the road, after the American military has fully withdrawn in 2011 and U.S. diplomatic influence has waned, Sadrists will make a play for the prime ministers’ post, said a leading party official who spoke on condition of anonymity because al-Sadr has forbidden his aides from discussing the negotiations. Having a Sadrist in power would endanger if not scuttle hopes of establishing a thriving democracy in Iraq that could be a model in the region. There are worries about how much influence Iran now carries over al-Sadr after offering him refuge for more than three years. “The Sadrists having a key role in the next government of Iraq was one of the few redlines that the Obama administration had,” said Ken Pollack, an expert at the Brookings Institute think-tank in Washington who was a key Iraq policymaker in the Clinton administration. Al-Maliki has been scrounging for allies since his political coalition fell short in the election to the secular Iraqiya coalition, which is largely backed by Sunnis and led by former Shiite prime minister Ayad Allawi. Neither side won enough support to control the government outright, touching off backroom dealing with other coalitions to garner the necessary 163-seat majority. Pollack, the U.S. expert, said the deadlock between al-Maliki and Allawi allowed the Sadrists to step into the void. “They have played their hand really skillfully,” Pollack said. Conspicuously absent from Friday’s announcement was Shiite cleric Ammar al-Hakim, leader of the devout Supreme Islamic Iraqi Council that was earlier aligned with the Sadrists. 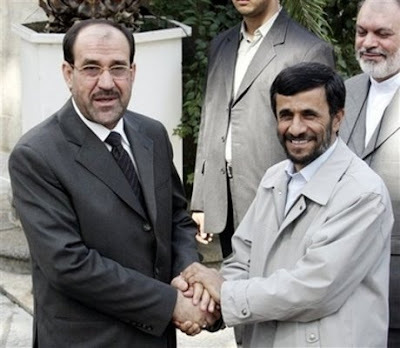 Aides to al-Hakim said he and about a dozen followers have not yet decided to back al-Maliki. Al-Sadr’s support for al-Maliki marks a turnabout, and is not likely to be embraced by all of his followers. For months, the group has demanded the prime minister be replaced, and Sadrist rallies routinely call for his death. AMARA, Iraq — The Shiite cleric Moktada al-Sadr, who in the past decade has been both an anti-American insurgency leader and a behind-the-scenes power broker, is not expected to be personally in attendance whenever Iraq’s leaders sketch out a new government. But with his followers standing to gain control of powerful government posts, his influence is likely to become apparent in many facets of Iraqi public life, from the halls of Parliament to the tomato farms and marshlands here in southeastern Iraq. Maysan Province was a stronghold for Mr. Sadr until sweeps by the Iraqi Army in 2008 helped break the grip of his militia forces, and political change ousted his ally from the governorship here last year. Now, the winds are shifting again, and the area has become a stage for Mr. Sadr’s remarkable political resurgence in Iraq after years of schism, military defeats and Mr. Sadr’s own flight to Iran. Mr. Sadr’s followers are pushing for control of the governor’s seat here in Maysan Province again, one of several positions they hope to gain as rewards for joining the political coalition that will keep their onetime enemy, Prime Minister Nuri Kamal al-Maliki, in office after the months of wrangling that followed March’s inconclusive elections. That the party, still Iraq’s most fiercely populist and anti-American bloc, has come this far is a reflection of the Sadrists’ efforts in recent years to recast themselves as maturing politicians who can actually govern and deliver badly needed services. In Iraq’s last government, Mr. Sadr’s followers were accused of using their offices to spread corruption and sectarian enmity, with officials lining their pockets and death squads roaming public hospitals. There are also remaining fears, among Americans and Iraqis, that the militia that helped bring Mr. Sadr to power initially — and was responsible for much of the sectarian violence that threatened to tear the country apart — could again be mobilized against his enemies, particularly after the American military finishes its withdrawal. The posture and power of the Sadrists have forced a shift in tone from American officials and erstwhile Iraqi rivals, who now find themselves thrown together an awkward partnership government. After fully embracing the political process, Mr. Sadr’s candidates pulled off surprising victories to win 40 seats in last March’s elections. Female members of the Sadrist slate, who campaigned in black, head-to-toe abayas, fared particularly well compared with their secular counterparts. The Sadrists are now embracing — at least in public — the sunny tones of national unity and partnership, referring to Sunni and Kurdish lawmakers as brothers, not foes. After dozens of Christians were massacred at a Baghdad church on Oct. 31, members of Mr. Sadr’s group visited the priests to show the party’s solidarity. They send out daily news releases to announce street-cleaning projects, new orphanages and community centers. And at Mr. Sadr’s behest, party leaders said that some newly elected lawmakers had been sent to Lebanon and Turkey to attend classes in public speaking and political etiquette. In Amara, the resurgence of the Sadr movement has stirred mixed emotions, as well as resistance from the current governor, Mohammed al-Soudani, who has a good working relationship with the Americans. BAGHDAD — Anti-U.S. cleric Muqtada al-Sadr has returned to Iraq after nearly three years in Iran, Iraqi officials said Wednesday. “He is our hero. We sacrificed for him. He said ‘No’ to the Americans and fought the Americans, and he is brave,” said Mohammed Ali, one of al-Sadr’s followers. Sadrist officials said he had returned after his movement struck a deal to be part of a new government. Al-Sadr, the scion of a Shiite religious family, galvanized anti-U.S. sentiment following the overthrow of Saddam Hussein and led two uprisings against U.S. forces in 2004. He fled Iraq sometime between 2006-2007 after an arrest warrant was issued for him. Al-Sadr’s political movement secured a deal to be part of Iraq’s new government after supporting incumbent Prime Minister Nuri al-Maliki for a second term in office. Iraq’s mainly Sunni neighbors are racing to try to regain their influence in Iraq, partly to counter Shiite Iran’s rising power. Iraq and Iran were long bitter rivals, especially under Saddam Hussein’s Sunni-dominated regime, and fought a brutal eight year war in the 1980s, which killed hundreds of thousands on both sides. Relations improved dramatically with the overthrow of Saddam’s regime and the installation of a Shiite-dominated government. 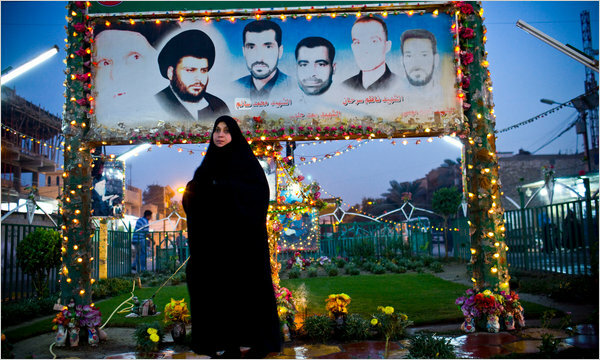 Iran is one of Iraq’s largest trading partners, and millions of Iranian Shiite pilgrims travel to Iraq yearly. One year ago today, I reported on the inauguration of Fr. Robert J. Koopmann, OSB, as the 12th president of St. John’s University in Collegeville, Minnesota. Two years ago today, on the 22nd day after losing my 2008 primary challenge against U.S. Rep. Michele Bachmann in Minnesota’s 6th Congressional District, in line with my focus on national security, I reported on the growing Taliban influence in Pakistan, a missile strike by a suspected U.S. drone in the northwest Pakistan tribal region near the Afghan border, ongoing violence in Iraq, and the reduction of U.S. military deaths in Iraq as Iraqi security forces increasingly take the lead in counterinsurgency operations.